This is my first day in the hide. Couldn’t get up this morning as was busy doing other things. When I got here I noticed the light was fading a bit, I was thinking have I missed the best light. I set up the hide refilled the feeders and went to check the camera. It had been set off however nothing had been captured. Battery is now dead so have had to take it home to recharge. Need to consider investing in a second battery so that I can just hot swap them. Went to car and got camera gear. Sneaked up to hide and set up camera. Light not fantastic so decided to set up a remote camera to the right of the hide so that could if needed to have some fill in flash. Also by doing this I would test out my new radio triggers that I have invested in on the advice of Rik and John. Nuthatch very busy today must be hungry. Have heard the woodpecker - however they are being very weary of me. I think that I need to leave the hide in place permanently so that they get used to it, like they have the cam net. I will discuss this with Martin the farmer. Martin has agreed to me fencing off the hide, now need to find time to do it. He has also said he will help me as he knows what he is doing. Got some interesting results today. 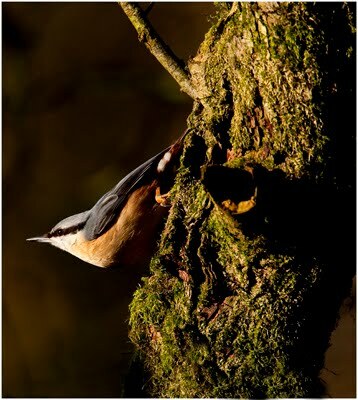 One image in particular I am very happy with as it is a shot of a nuthatch arching its body - a shot that has eluded me for years. Have looked at the results of the flash, this needs to be looked at. I think I need to use two of them and use the light meter to set them so that I can use my camera set to manual mode and this will allow me to have more control of the exposures. Need to look at where to set the flash guns to think about the lighting of the birds. Could consider snooting them.